I’m so pleased to be here! This week’s been great – lots of interesting things to do, lots of laughing and lots of relaxation. I went to San Michele beach on Monday with a friend and spent most of the day there – we splashed out on umbrellas which is something I never do. The beaches here aren’t like in the UK where you can basically go wherever you want – people here own bits of beach and they set out umbrellas and sun loungers which you need to pay for. For the whole day it was 6.50 Euros. I’ve decided that’s a bargain given the reduced chance of skin cancer! I might do that more often, despite my underlying dislike of these private beaches (it just doesn’t seem right for people to be able to own such lovely bits of land!). I went on a blackberry picking mission last week after seeing loads in the countryside the weekend before. I hadn’t wanted to look too closely because I was annoyed I’d not brought any bags. So, laden with tuperware and bags, I headed out on Wednesday. Alas, I picked about 40 – they were all small apart from the ones that were hovering over hidden ditches (it turns out), too high to reach or protected by a particularly nasty looking creepy crawly. I’m not cut out for the countryside really, particularly blackberry picking – I spend an inordinate amount of time screaming. You should have seen one of the spiders that dropped down in front of my face whilst picking blackberries. It was more like a giant crab. 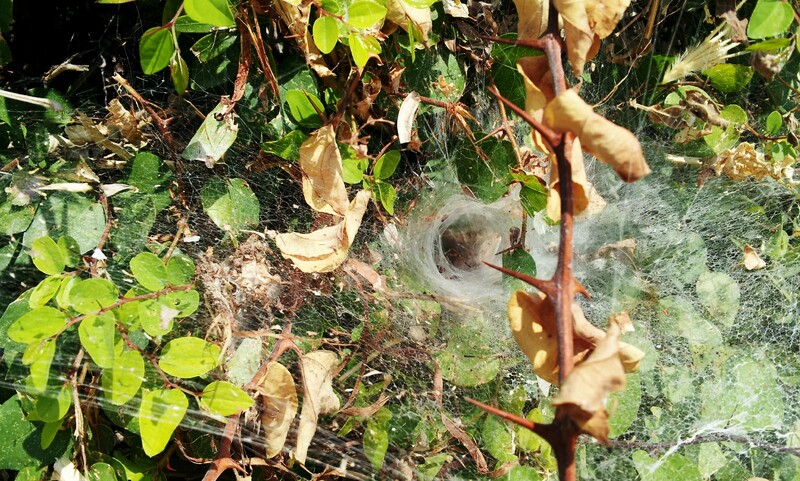 And look at this Web of Horror below…! 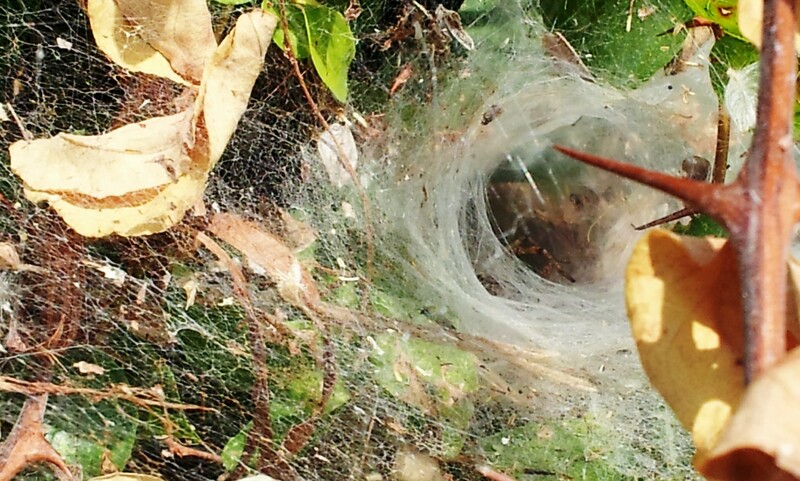 I if I was an insect and got stuck in this thing, I think I’d die on the spot. If you look closely, you can see a creepy horrible leg sticking out in a creepy horrible fashion <shudder>. Can you see the creepy horrible leg?! I’ve found a shorter round walking trip that starts from my house. My parents are going to come out in a couple of months so I’ve been trying to find a nice local parent-friendly walk. On Thursday I went out with some friends to a Piadineria (a place where you get piadinas – the Italian filled flat breads that I tried last week) called “El Merendero” in a village/town called Marotta which is close to Senigallia. They make lovely piadinas but you can’t book. We ended up waiting an hour for a table and finally sat down to eat about 10pm, and then it took a good while to be served so by the time we actually ate, I could have eaten a horse (but that’s in the next region up…). 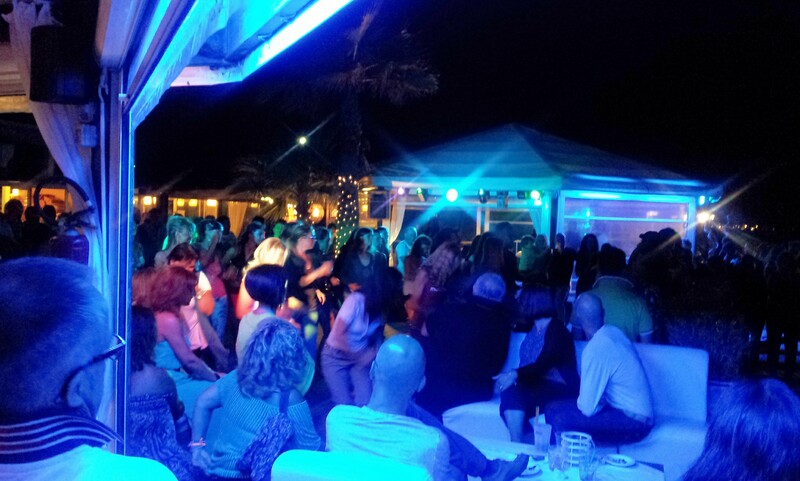 Then we headed to a bar, “Essentia di Mare” in a village/town called Marzocca, also near Senigallia where they played latin music and there was a couple of dance floors. I had a ball! It’s the first time I’ve danced anywhere apart from my kitchen for months. One of the Italian guys we were with asked me to dance – I don’t think the poor guy expected me to be quite so inept and spend the entire time laughing. And they had these group dance sessions – they were hilarious too (for me at least). It was a lot of fun. On Friday I went on an art course evening with an artist that has a studio in the piazza. There were three of us altogether – the teacher, me and another girl – both a similar age to me so it was a really lovely couple of hours. 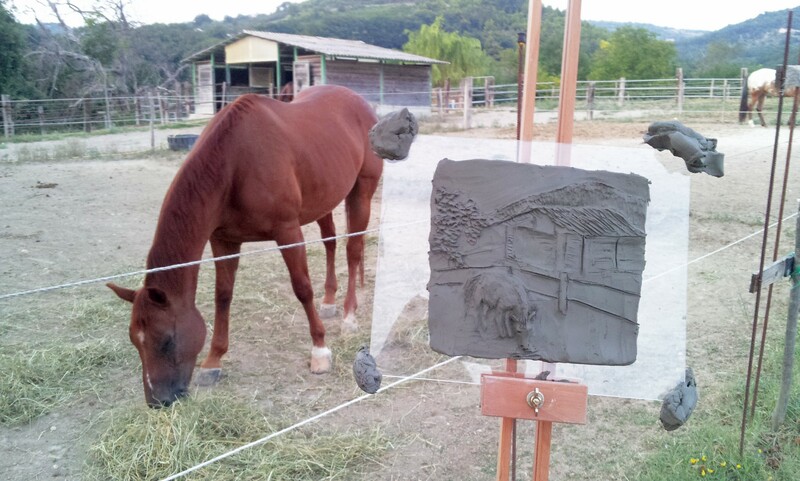 We headed to behind one of the local agriturismo’s where they have a stable and set up our easels there – we didn’t paint – we had blocks of clay which we worked to represent the scene in front of us. That was something new for me so I was pleased about that! Mine has split in two now – I think it dried too quickly but it was a really good experience and very relaxing to be out in the countryside doing arty stuff. I’m going to try and get an easel soon so I can head out and do a similar thing myself. 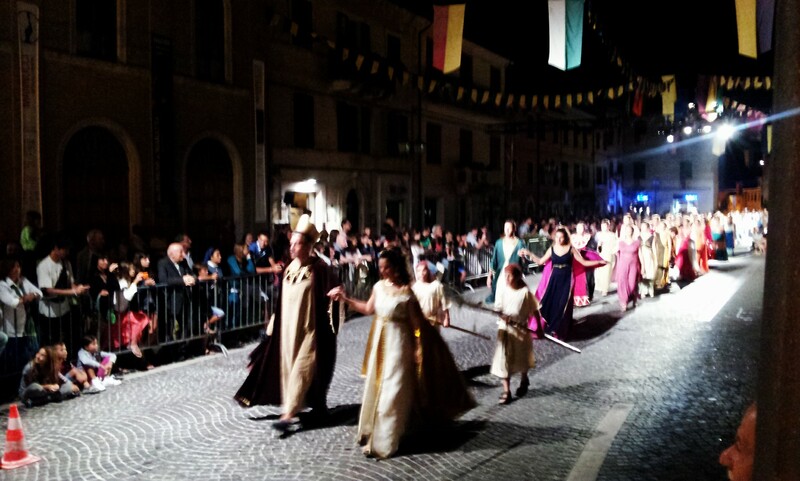 The Camerano festival has started. I’m just so impressed with our little town! They’ve been making such a lot of effort – the whole town is decorated with ribbons and fabric for this “Festa Del Patrono” which started in earnest yesterday. 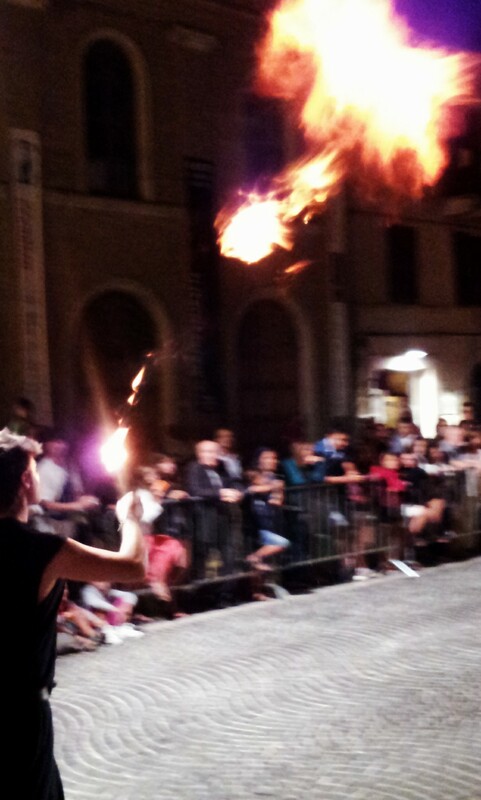 The opening event was in Piazza Roma (the centre of Camerano) where they had a “Spettacolo Spettacolare” – a tongue twister if ever there was one – basically, a spectacular spectacle which in this instance was a sort of parade of drummers, dancers, fire breathers, roman gods (or people dressed as them at least), kids with ribbons and pompom things. I haven’t seen so many people in one place since I’ve been here. I thought I’d treat myself to a glass of wine and on being asked if I’d like a small or a large glass, I opted for large based on in England a small glass being akin to a thimble. In fact, a large glass is a very large glass here though – a pint! I’ve never had a pint of wine before! Perhaps we’ve been missing a trick in the UK. And it was only 2 Euros. So, I found a good spot in the piazza, sipped my pint of wine and watched the spectacular spectacle, which was, well, I think, spectacular! Eurovision Song Contest style presenters… complete with same wooden script! I’ve acquired more Italian people to speak to. When I have something I want to say, if I’ve got an opinion on something or if I’m recounting a story, I’m a bit more fluent. If it’s just general chitchat, then I’m still useless. General chitchat should be easier surely? But it turns out that if you have something to say, you forget that you can’t speak the language and you just get on with it. Having said that, this improvement only applies during part of the day. My Italian deteriorates rapidly in the evening (even without wine!). My brain seems to have a daily best before time – it just doesn’t function in Italian after about 8pm. It’s annoying because that’s when people want to go out! I’ve never detected this phenomenon with anything else – I never found my job harder in the afternoon than the morning and I don’t *think* I was ever visibly worse! I’ve been watching Italian films without getting distracted: “Benvenuti Presidente”, “Pazzo di me” and “Il 7 e l’8”. The last two I watched on YouTube, the first one on the list I watched on some dodgy Romanian website that gave me a virus and had Romanian sub-titles. I don’t recommend that website. But I’m pleased that YouTube has a seemingly infinite number of Italian films and other films dubbed in Italian (in fact, I watched” Enemy of the State” in Italian too – it’s less mentally exhausting if you know the film already). Alas, there aren’t often subtitles on the films on the internet but as a learner, if you go for something suitably action-y, then it’s easier to follow. In fact, of the list above, all of them were ok to understand. And it’s really helpful to watch with an Italian so you can stop (constantly) and check your understanding. I had been watching CSI but the TV is in the kitchen and it’s difficult to maintain concentration if there are housemates here and if there’s Nutella in the cupboard. I’ve been looking up absolutely everything I don’t know how to say in Wordreference. You can’t keep looking up all the words that you come across otherwise you’d never get anything done, but you can look up the things that YOU want to say and it sinks in a bit easier because it’s more relevant to you. After the 10th time of looking it up, sometimes it sinks in. Learning stock phrases is helpful, particularly if they’re complicated constructions. I’d hoped to just be able to produce them off the cuff if I knew the logic behind them but for example, I don’t think I’ll ever be able to work out how to use Italian pronouns without sitting down with a pen and notebook for 15 minutes first. However, if you know “he told me…”, “I asked him” etc., then you can just pull them out of the bag without having to think too much. And it turns out the more you know, the easier it is to find out other things and remember new words. You don’t have to rely solely on charades! 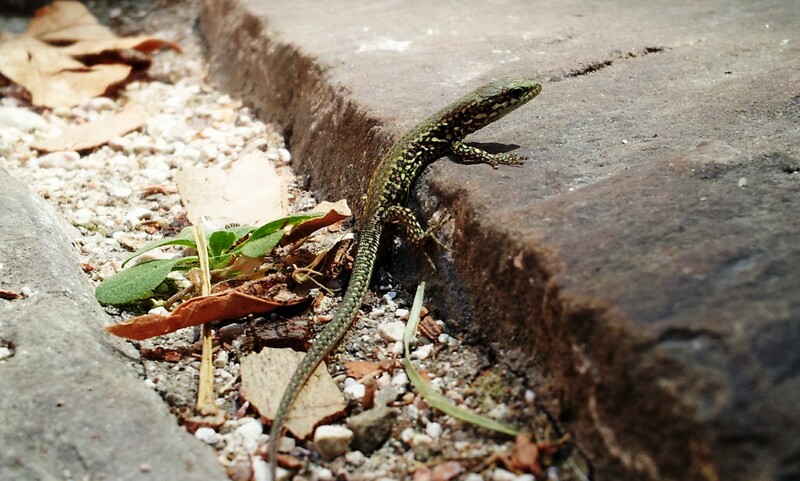 It’s been a while since Lizard Watch – and I’ve recently discovered a new type of cutie little dark green lizard so to combine with this week’s “What’s a bit odd” – here’s a picture of Super Lizard. He looks like he flies. I don’t think he actually does. Cute, cute, cute. I think this is my favourite lizard shot. He looks like he’s flying. Hope you all have good weeks.